You don’t need an Instant Pot for perfectly cooked eggs (with shells that slip right off!) thanks to this simple technique. “Easy Peel Eggs” can be prepared with soft, medium, or hard yolks and will store in the fridge for a week. Have you ever hard boiled farm fresh eggs? If so, you likely had a heck of time peeling them. 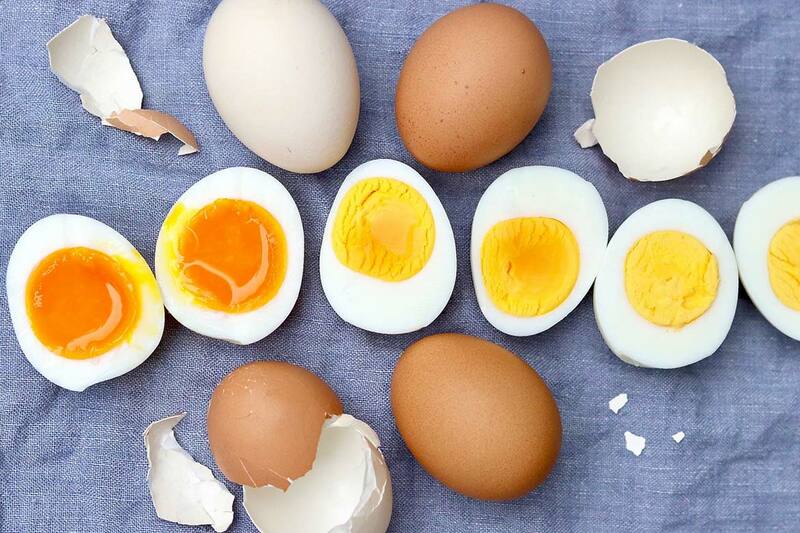 Sometimes, not-so-fresh eggs can be a challenge to peel, too. I thought I mastered the art of boiling eggs some time ago, but after reading about the merits of cooking eggs in a pressure cooker or the über popular Instant Pot, I realized there was an even better way. And the thing is, you don’t need one of those fancy contraptions to do it. After reading that eggs cooked in a pressure cooker (or Instant Pot) are extremely easy to peel, I tried. And they did. Eggs cooked this way were actually fun to peel! For obvious reasons, the Instant Pot method became the only way I wanted to boil eggs. (Especially because we have backyard chickens, so our eggs are usually fresh and hard to peel.) But for those who don’t have a pressure cooker or the increasingly popular Instant Pot, there’s an equally good way: steam the eggs. You can buy an inexpensive steamer basket, often in the baking aisle of the grocery store. A rack that fits inside your pot will work, too. You just don’t want the eggs to be submerged. For the sake of the photos, I pulled eggs out in the middle of the recommended time ranges for the medium-hard and hard cooked yolks. The time of six minutes for soft boiled is pretty accurate, as a minute less is too soupy and a minute more is slightly firmer than soft boiled—although still tasty. Do note that factors such as egg size and precise heat setting will affect the cooking times somewhat. That said, these ranges should be quite helpful. My personal preference is an egg with a yolk that’s slightly undercooked (it’s creamier that way), so I steam them for 11-12 minutes. As mentioned, these instructions include a water bath for best control. As an option, I sometimes stop the eggs at 11 minutes and then put some in a cold water bath and let others cool without rinsing. The eggs that don’t sit in the cold water continue cooking until the yolks are evenly cooked through but still tender and creamy. Those who like the just undercooked eggs enjoy the ones where the cooking process was stopped and are a little soft in the center. When cooking for different preferences, you can store the eggs in different labeled bowls or use a Sharpie to mark the eggshell. 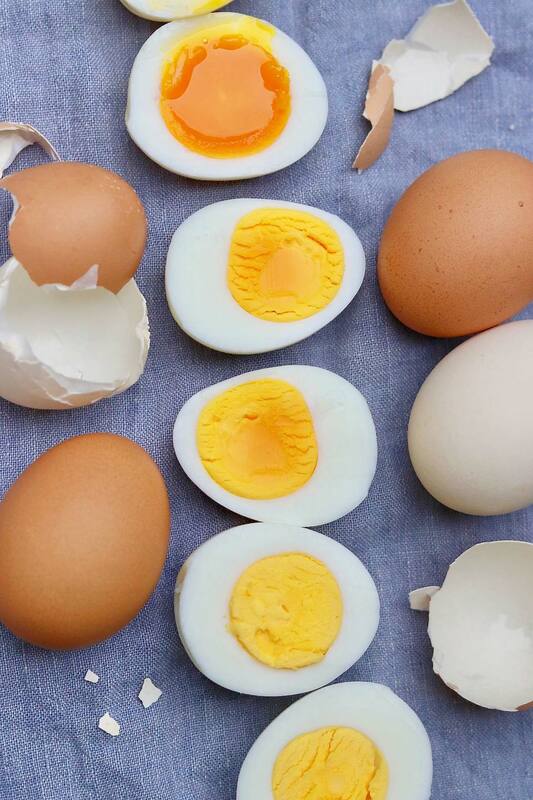 To best preserve freshness, store any eggs that aren’t used the same day in the fridge with the shells intact. Start with eggs that are cold from the refrigerator. Once the water has come to a boil over high heat, add the eggs, and then reduce the heat to medium-high. Cover immediately and set your timer. Place the eggs in the steamer basket in an even layer. Cook up to 6 eggs at once. 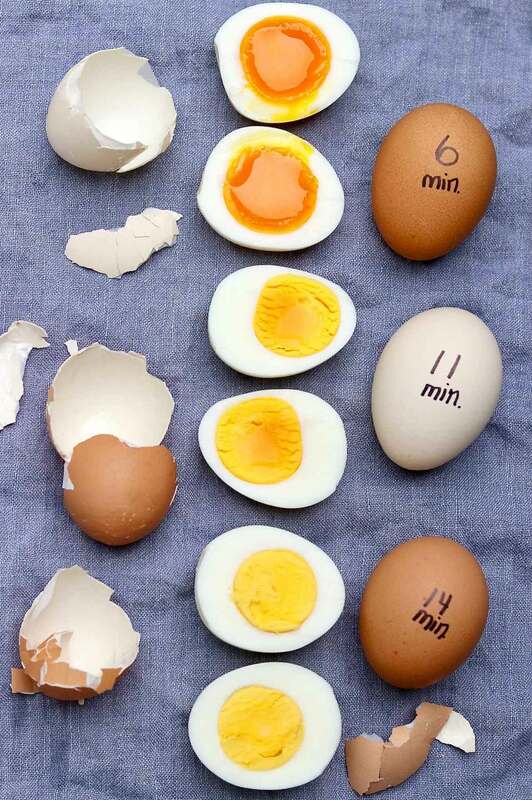 If you want to cook more than 6, you’ll likely need a few extra minutes of cooking time and the eggs may not all cook evenly. Make sure to keep the pot covered. Have an ice bath ready to stop the cooking process. The first time you use this technique, check one egg a minute or two early in order to determine the perfect level of doneness for you. You don't need an Instant Pot for perfectly cooked eggs (with shells that slip right off!) thanks to this simple technique. Place the steamer basket or rack in a lidded saucepan or pot, and fill with as much water as needed to reach the bottom of the steamer basket (about 1 inch or so). Heat the water on high heat until it is rapidly boiling. 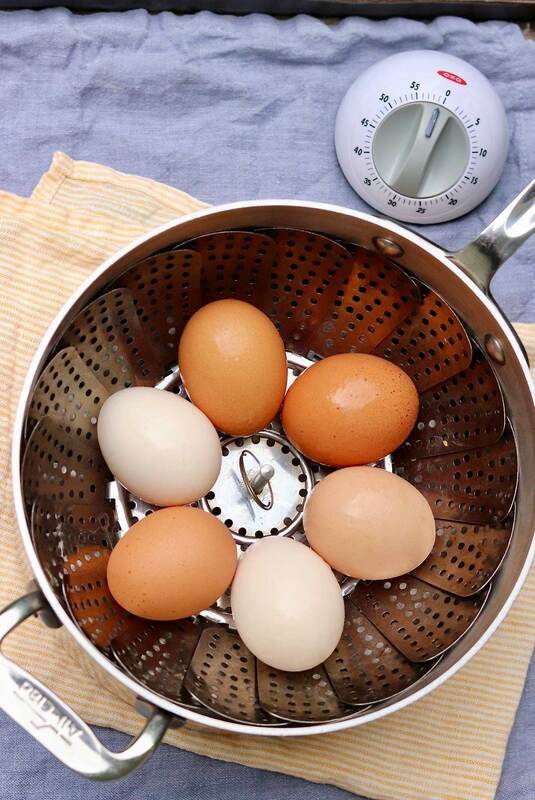 Remove the pot from the heat and quickly but gently place the eggs in an even layer at the bottom of the steamer basket. Put the pot back on the burner, reducing the heat to medium high. Cover the pot. 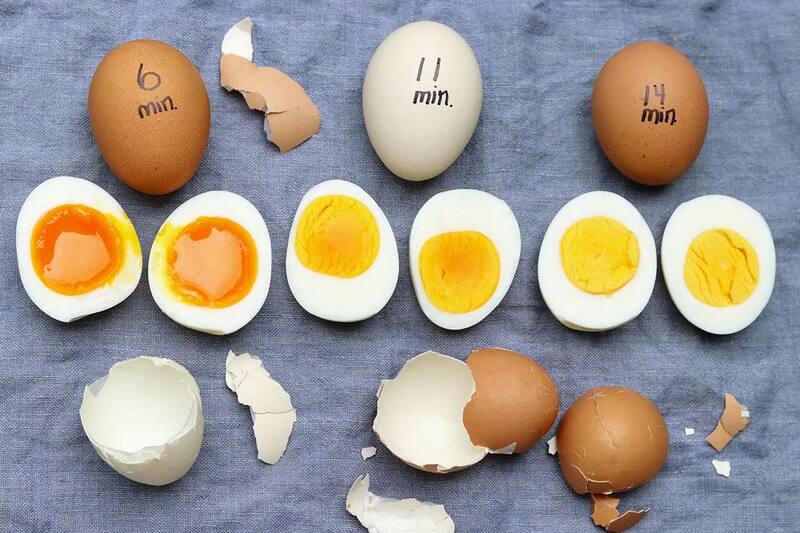 Set your timer for 6 minutes for soft boiled, 10-12 minutes for not-quite hard boiled with a partially translucent and bright yolk, or 13-15 minutes for fully cooked-through hard boiled. Remove the eggs to a bowl of ice water with a slotted spoon, or run cold water directly into the pan to cover the eggs and quickly cool them. To best preserve freshness, store the eggs, unpeeled, in the refrigerator for up to a week. This method works best if the eggs are in a single layer. If you’d like to cook more eggs at one time, you’ll likely need to add a couple of minutes to the steaming time and the eggs may not all cook to the same precise degree of doneness. I put my eggs into other cold water and start timing when water comes to a boil. Boil for 9 minutes. Submerge immediately into cold water. Thanks for mentioning and Happy 4th, Gram. ❤️ The main difference with steaming is that the eggs are easier to peel. Hello Ann and Happy 4th of July. I am going to have to try your method of steaming eggs to make hard boiled eggs. I have always used a egg cooker to make hard boiled eggs. You pierce one end of the egg and place it in the egg cooker, fill the egg cooker with the correct amount of water for soft or hard boiled eggs. The eggs are not submerged in water, but sit above the water It takes about 10 or 15 minutes for hard boiled eggs. In this method the eggs are being steamed but I can still have trouble peeling the eggs. I have learned not to use eggs I just purchased but to use eggs that have been sitting for a few days in the refrigerator. But I am definitely going to have to try your method. I already have the above mentioned steamer which I use for vegetables. Thank you for this great tip. Thanks for your comment, Gail. Steaming–either in a pressure cooker or with this simple method–is the only way I’ve found to easily peel really fresh eggs. I hope you find this to be true as well! It’s almost 3:30 a.m. and I am now hungry for a soft boiled egg! I will have to try this method. I have an instant pot but have not used it very much. Love it…sounds like great late-night (or early morning as the case may be) fare to me! I have an Instant Pot, too, but this method is actually quicker because you don’t have to wait for the cooker to come to pressure. Enjoy!